The Environment Agency reported 122 offences of fishing during the close season, following 670 patrols carried out in the restricted period. 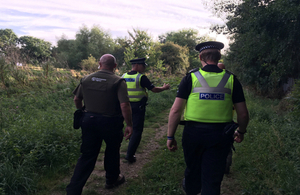 The targeted patrols also detected 179 other offences, mainly unlicensed fishing. Environment Agency Fisheries Enforcement Officers were supported by 232 Angling Trust Voluntary Bailiff Service members, carrying out over 5,000 hours of patrols under Operation CLAMPDOWN. Now in its 5th year, Operation CLAMPDOWN is a joint initiative between the Environment Agency, Angling Trust’s Fisheries Enforcement Support Service, UK National Wildlife Crime Unit and police forces, aimed at gathering intelligence about illegal fishing and responding through targeted patrols. The volunteers reported 111 suspicious incidents to the Environment Agency and police. The coarse fish close season restrictions are imposed in order to protect vulnerable spawning fish, helping to safeguard fish stocks for the future. Patrols took place across rivers, streams, drains and specific canals and stillwaters covered by the coarse fish close season byelaw, which runs from 15th March – 15th June inclusive. The vast majority of anglers fish legally; sadly there is a small number of anglers who cheat others by fishing during the close season. The coarse fishing close season helps protect vulnerable spawning fish – this is why it’s in place. It is still possible for anglers to fish during this time on many stillwaters and canals, which are open all year round. We respond to the intelligence we receive about illegal fishing by ensuring our patrols are targeted at the right places – and the right people. These figures show that during Operation CLAMPDOWN 5, Phase 1 Volunteer Bailiffs throughout England demonstrated their massive commitment to protecting fish and fisheries and cracking down on illegal fishing. All anglers can help this process, in fact – at any time of year – by reporting information and offences in progress to the Environment Agency on 0800 80 70 60, or the police on 101/999 as appropriate. The enforcement work was supported through a network of 474 Angling Trust volunteer bailiffs covering all counties in England. Patrolling under operation CLAMPDOWN for a 5th year, they assisted by reporting illegal fishing incidents and information to the Environment Agency and police. Anyone who suspects illegal fishing to be taking place should report the matter to the Environment Agency’s incident hotline on 0800 80 70 60.